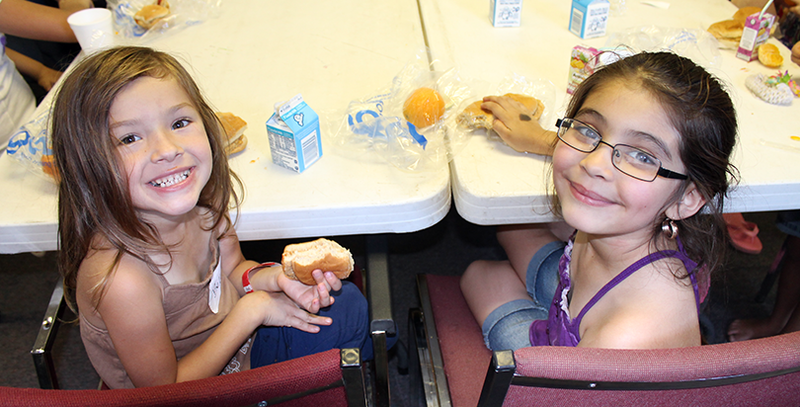 Millions of kids who need summer meals are not getting them. Here's what can be done to change that. The saying goes that there’s no such thing as a free lunch. For some people, this is nothing more than an aphorism, but for millions of children who receive free or reduced-priced lunches at school, during the summer it’s a harsh reality. Nearly 21.5 million kids in the U.S. are eligible for free or reduced-priced meals, yet according to a 2016 report from the Food Research Action Center, only 1 in 6 of them receives that benefit over summer break. How much struggling children rely on their school lunch program was brought home during the Democratic National Convention when actress America Ferrera, the daughter of Honduran immigrants, credited the opportunities afforded her by public schools and public arts programs. “And you know what, occasionally I needed a free meal to get through the school day,” she said, her voice catching. So that children without enough to eat could be fed during the summer as well, the U. S. Department of Agriculture developed two programs during the 1960s; the National School Lunch Program, which allows schools to continue serving meals during vacation, and the Summer Food Service Program, which allows schools as well as outside organizations to sponsor community meal sites. In 2015, these programs received roughly $12 billion and $495 million in funding respectively, according to an annual report from the Department of Agriculture. Although they served 3.2 million children nationwide last year, the food programs are met with varying degrees of success, and are often not equipped to face the unique challenges that arise during the summer, such as a lack of transportation and difficulties communicating with families. The New York City Department of Education stands out for its ability to reach hungry students during the summer. 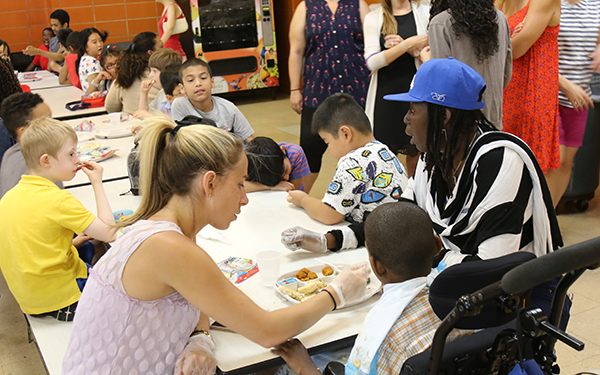 Between 70 and 80 percent of NYC’s 1.1 million public school students who are eligible for free or reduced-priced meals received summer meals in 2014, according to the New York City Food Policy Center. On a recent summer day with temperatures nearing 90 degrees, a handful of children climbed the jungle gym outside M.S. 131, while dozens more lined up inside waiting to be served their lunch for the day: chicken nuggets, cucumber salad, a side of apple slices and a carton of milk. At the school in Manhattan’s Chinatown, around 800 children a day stop by the cafeteria for free meals. Principal Phyllis Tam says her school’s feeding site is a well known safe haven for children that live in the area. In addition to serving neighborhood kids, the school also feeds children from various nearby day camps, including the Chinatown YMCA’s Beacon Program, which is run out of the NYC school. Unfortunately for children like Tan living in other parts of the country, access to free summer meals can be much harder to come by. Oklahoma’s child nutrition programs face far greater obstacles. In 2015 less than one in 10 low-income children in the state received summer meals, according to the Food Research Action Center. For the second summer in a row, Oklahoma had the lowest participation in the National School Lunch Program in the country. Oklahoma schools get out in May and the research center collects its data in July so it’s possible that timing might be partly driving its low participation numbers (June is likely a stronger month) but the fact remains that Oklahoma’s child nutrition programs are in need of assistance. In 2015, the state was selected by the USDA as a “target state” for the Summer Food Service Program based on its high rates of food insecurity and poverty. As a part of that effort, Oklahoma has been working directly with federal officials to set higher goals and improve the distribution of summer meals. Debbie Hamilton, the director of child nutrition at the Oklahoma Department of Education, said the lack of a structured schedule leads to increased difficulties feeding kids when they are not in school. “I have actually had school (district) food service directors come to me and say ‘I lost money the last two summers on that program. I’m not going to to go into the homes, wake the kids up, make them get dressed, and bring them to school to eat a meal,’” said Hamilton. Because of this, many schools eligible for the National School Lunch Program choose to opt out, she said. And unlike during the school year, when all schools can participate in the National School Lunch Program to feed hungry students, in order to qualify during the summer, schools must be located in a district where at least 50 percent of the population is eligible for free and reduced-priced lunch. That high bar leaves communities that don’t qualify to be more reliant on the Summer Food Service Program, where either a school or an outside organization can sponsor a meal site. One of the biggest sponsors in Oklahoma is the non-profit Feed The Children. This year they are sponsoring 58 sites across the state, all of which include an educational or enrichment component, such as organized sports or arts and crafts, as well as food. One of them, the Oklahoma City Dream Center, is entering its second year now after transitioning from an annual one week sleep-away camp to a two-month-long day camp. “Several times we had kids tell us that one of their favorite things about going to that camp was being able to eat until they were full,” said Assistant Director Michelle Castle. Although there are many reasons Oklahoma struggles with summer nutrition programs, the root cause seems to be a lack of transportation. Several states including Oregon, have begun to seek a way around the transportation barrier. “For our rural families… they don’t have access to churches or school sites or anything in the summer to receive summer meals,” said Janet Dornhecker, project manager at the Oregon Department of Human Services. This is where Summer Electronic Benefit Transfer comes into play. The program, which started in 2011 as part of a special USDA trial, works the same way the Supplemental Nutrition Assistance Program (SNAP) — or “food stamps” — does. All eligible families are provided with a monthly subsidy to help pay for food which they buy themselves at the grocery store. In Oregon, families get about $30 a month per child. Among them is Karen Center and her 11-year-old son Curtis. Center, who has participated in the program from the start, said it gives her one less thing to worry about. “Trying to feed a child and make healthy meals that last the whole summer vacation, that’s really hard,” she stated. Prior to enrolling in Summer EBT “we kind of went day-by-day just trying to make it,” Center said. Although she lives in Portland in close proximity to summer feeding sites, Center doesn’t drive, which can make it difficult to get her son to places where they’re serving meals. “[Using the EBT is] a lot more convenient than going to a park or school and I can use it to provide meals for both of us,” she said. Right now, Oregon, Michigan, Texas, Connecticut, Missouri, Nevada, Delaware and Washington are the only states where Summer EBT is available. 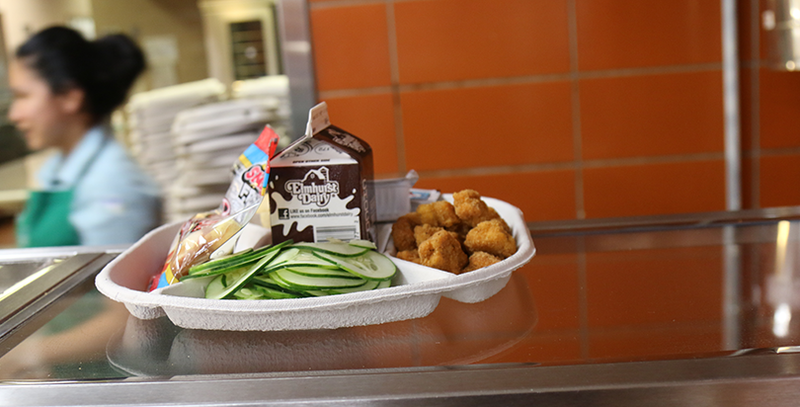 The Child Nutrition Act is set to expire in September, which gives Congress a much-needed opportunity to reexamine the summer nutrition policy but larger political struggles around the school lunch program may eclipse that. A Republican reauthorization bill in the House of Representatives would make it more difficult for high-poverty schools to offer free meals to all children and would roll back some of the requirements of the 2010 Healthy, Hunger-Free Kids Act, which brought more fruits, vegetables, and whole grains into school lunchrooms. “This dangerous proposal would end decades of bipartisan support for the Child Nutrition Act and could literally take food from the mouths of some our most vulnerable citizens – young children from low-income families,” Kate Birnbryer-White, executive director of the anti-poverty coalition, Michigan Community Action, wrote in a July op-ed. Aside from offering Summer EBT to all states, there are a few other solutions being discussed that could help improve summer nutrition across the U.S.
One suggestion is to implement the Summer Food Service Program year round as a part of the National School Lunch Plan, rather than requiring sponsors to re-register each summer. FitzSimons said this would cut down on paperwork and administrative costs, and potentially encourage more groups to sponsor sites. Other improvements outlined in the Food Research Action Center’s 2016 “Hunger Doesn’t Take a Vacation” report include allocating funds for transportation to and from sites and lowering the eligibility requirement for the National School Lunch Plan so that only 40 percent of kids in a district need to qualify for free and reduced-priced lunch. Rebecca is a journalism and political science student at Stony Brook University and a summer intern for The 74.